Please check product description before selecting any optional extras. All optional extras include free fitting / installation where applicable. Our Best Selling Door Opener, the ChickenGuard© Premium. Combining both a Timer and a Light Sensor, this gives you the ultimate in flexibility for controlling the pop-hole door. Easy to setup with an integrated LCD screen for straight forward setting and adjustment, our Premium Door Opener is the one to go for! 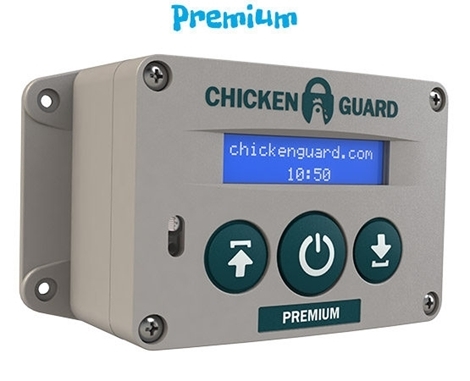 Our ChickenGuard© Premium comes packed with some great features including an Integrated Timer and Light sensor, full manual Door Control and our unique Failsafe Mode for that extra peace of mind giving you total flexibility over how and when you want the pop-hole door to be opened or closed. The electronics are enclosed in a weather proof casing and made using high-grade materials in our factory in Britain and that includes the electronics. We manufacture the complete assembly from the ground up, so we can keep a close eye on quality. You even get a no quibble 3-year guarantee – but your unit should last a lot longer than that! Running on 4 x AA batteries (included) or electric powered via USB cable (cables not included), our Premium door opener has been designed with ease of use in mind. 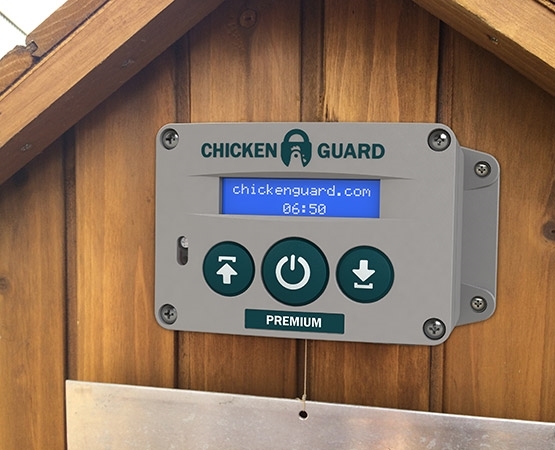 Simply secure the ChickenGuard© to the front of your coop, set your opening and closing preferences and you are away. We have even made the buttons extra big so that you can easily press them with gloves on in the winter! Over 50,000 users worldwide trust ChickenGuard© to protect ‘their girls’. Opens and closes using the timer and/or light (LUX) sensor. Configurable fail-safe timer for light (LUX) sensor – closes door at the set time even if it is still light. Easily adjustable light (LUX) sensitivity when using the light sensor. Manually open & close the with simple press of the button. Powered by 4 x AA batteries (included) or electric powered via USB (not included). Door closed indicator visible up to 100 metres away. No complicated wiring or cabling. No minimum or maximum door heights. 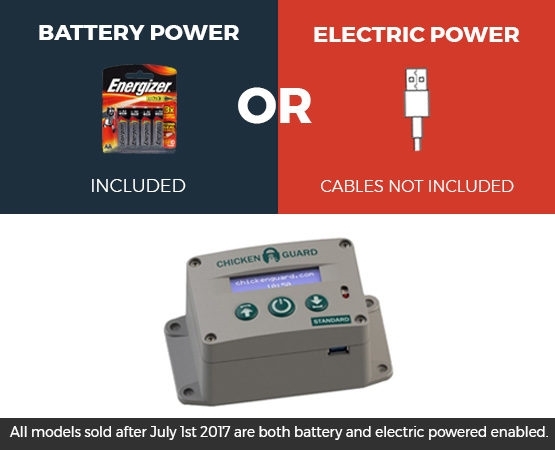 Designed for use with Chicken Guard door controllers.